Jewelry for a Cause began in 2008 and was started by former attorney and mother of two, Jessica Mindich. The company is founded upon the concept of simplicity. Well, that and affordable, yet urban cool jewelry pieces for which profits could be used to raise money for various charities and schools. Currently, Jewelry for a Cause work with artisans the world over. This provides a sustainable living for them. You love it, right? Sure you do. It's awesome! The Caliber collection comes from Mindich's illegal guns buyback programs. These are the only two (EVER) privately funded voluntary gun buyback and amnesty programs in Newark, New Jersey's history. This resulted in a whopping 395 illegal guns taken off of the streets. Did we mention that Newark, New Jersey is one of the sixth most dangerous cities in the United States? Yeah. It is. 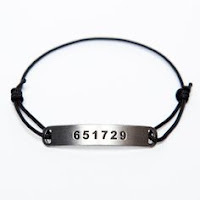 The bracelet that we were fortunate enough to receive is a simple, yet strong cord with 6-figure number, engraved onto a metal plate. This figure is a unique serial number of one of the previously mentioned illegal firearm pieces (see the text above this text). This is a limited edition piece and proceeds will be donated to for future Gun Buyback Amnesty programs in Newark. The underside of the bracelet has the letters, "JfaC" and the MTV logo. Sweet. You can get your bracelet and other Jewelry for a Cause gear at the URL below.